MAHA50. 5 Oit. C2-C7. Lâminas: Pau Rosa Honduras 72-40 mm. Afinação A: 442 Hz. Frame: Voyager. Largura: 255 cm.Topo Grave: 106 cm. Topo Agudo: 50 cm. Altura Ajustável: 88-108 cm. Artist Marimbas. For the most innovative series of marimbas available on the market today, you need to look no further than the Artist Series from Adams. Both the Robert Van Sice model marimbas and the Artist Classic marimbas, with their beautifully stained wood rails and end pieces, are manufactured with the highest levels of craftsmanship and quality materials, to meet and exceed the demands of today's top marimba virtuosos. Only hand selected exquisite Rosewood is used to create these outstanding instruments. 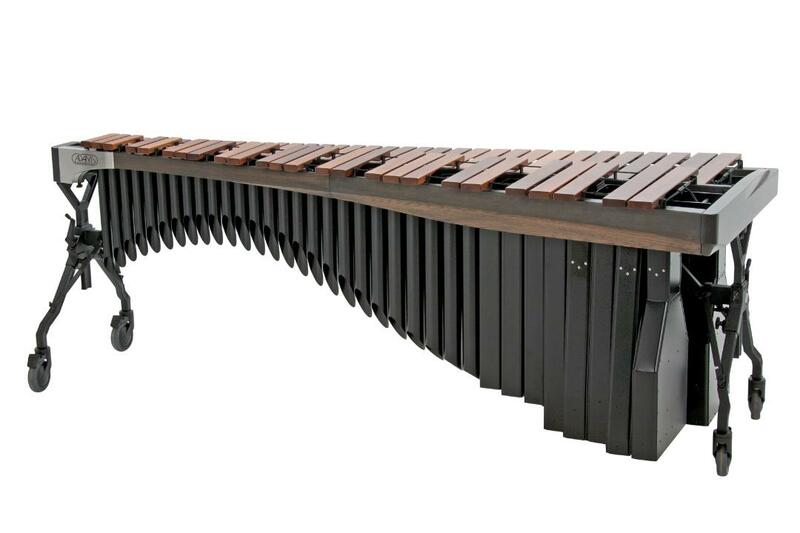 This insures that every Artist Series Marimba we produce provides the rich tone and perfect pitch that has become synonymous with Marimbas bearing the Adams name. Adams is the only company producing bars meticulously precision tuned though an incredible sixth overtone in the lower register, using a specially designed proprietary computer assisted method. This exclusive tuning process gives Adams Robert Van Sice model and Artist Classic model marimbas the most stable pitch and evenness of sound available, and allows Adams complete control over all aspects of the marimba's sound. Artist Alpha Marimbas: At first sight, the visual energy of Alpha Series captures your attention – the design’s flowing lines and uninterrupted curves draw you towards the instrument. After playing the keyboard for a few moments, the advances made possible by the new Alpha tuning method are apparent – the open, resonant, and full sound of the instrument sets a new benchmark for quality. The newly developed Alpha tuning method allows Adams’ master tuners extremely precise placement of overtones. The Alpha tuned keyboard is perfectly balanced and resonant throughout the range, with the best in tune bar possible. Adams’ exclusive, proprietary computer assisted tuning method allows the lower register of the marimba to be tuned through a sixth overtone. These meticulous efforts create stable, in tune pitch that projects with warm and clear tone.